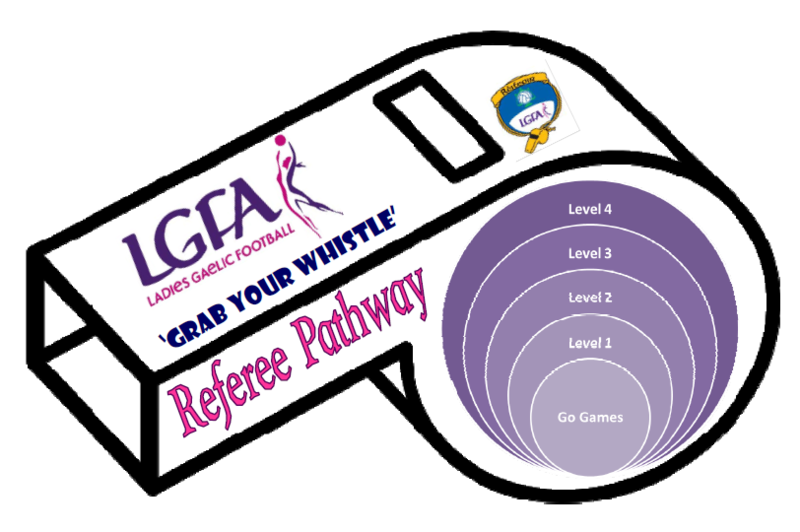 Grab Your Whistle is our Referee Education Programme. Through the Grab your Whistle courses we aim to increase the number of new referees, and in particularly female referees, who officiate at our games. Participants must be 17 years of age or over. There is also a Go Games Referee Course available for participants from 15 years but this will only allow to referee up to under 12 non-competitive small sided games. Duration: Course is maximum 3 hours in duration which can be held during day or over an evening. TY/AS Level Grab Your Whistle is also included at this level. Duration: Course is maximum 14 hours in duration plus the blitz day (14 hours course work and minimum officiating at organised county blitz). Course consists of two 6 hour contact days, one non competitive blitz day and one 2 hour evening. Maximum length of time between day 1 and 2 must be three weeks and maximum of four weeks between day 2 and blitz day along with blitz day and day 3. All participants must officiate at organised county blitz day between day 2 and day 3. Participants must complete the FULL course to get certification. This is a refresher course on the rules of Ladies Gaelic Football. This course should be organised annually by every county to ensure all referees are fully aware of the rules of the game. All participants must have completed the LGFA Grab your Whistle Level 1 course or have refereed gaelic football for a minimum of 5 years. This course is organised once a year for referees on our Provincial Panel. The content varies every course and it is aimed to ensure consistency in provincial refereeing and that Provincial Referees are continually developing their skills. Referees will receive a written and fitness assessment. This course is organised twice a year for referees on our National Panel. The content varies every course and it is aimed to ensure consistency in national refereeing and that National Referees are continually developing their skills.